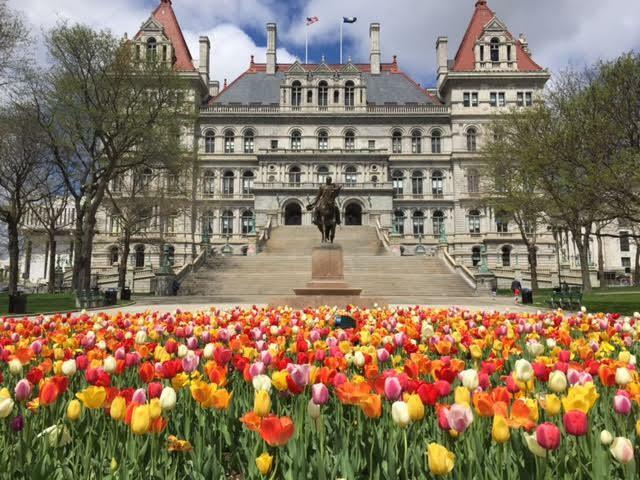 The New York legislative session is due to end in three weeks, and some state lawmakers believe they will accomplish so little in that time, that they are talking about leaving a week early. Political gridlock in the state Senate, and worsening relations between Governor Andrew Cuomo and majority party Senate Republicans has led some lawmakers to say that perhaps they should end the session early. But Assembly Speaker Carl Heastie says his Democratic members are staying until at least June 20th, the scheduled end of the session. Senate Democratic Leader Andrea Stewart-Cousins says her conference will also remain. But the Senate is gridlocked with 31 members in each of two factions. Thirty-two members are needed to form a majority in the chamber. 31 Democrats all now meet together under Stewart-Cousins. One Democrat, Senator Simcha Felder, meets with the 30 Republicans. The Senate had 31 Republicans but one GOP Senator, Tom Croci, left earlier this month for active military service. Senate Democrats tried to force some action, and proposed a hostile amendment that would enact the women’s reproductive health act. It would among other things codify the abortion rights provisions in the Supreme Court’s Roe v Wade decision into New York State law. Abortion has been legal in New York since 1970. Andrea Miller, President of the National Institute for Reproductive Health says that’s led to a “false sense of security” because, she says the 48 year old laws are outdated. Miller came to the Capitol to push for the measure. Susan Lerner, with the government reform group Common Cause, says there is a way the deadlock could be broken. Democrats and Republicans could get together to vote on bills that they agree on, something she says seldom happens in Albany. She says there are other unresolved issues as well, including election reform and early voting, bail reform and the child victims act to give survivors of childhood sexual abuse greater access to the courts to sue their abusers. Some other items include expanding sports gambling, now that the US Supreme Court has said that states can allow it. And the Cuomo Administration’s Department of Health is expected to soon release a report detailing how to legalize recreational marijuana in New York. Assembly Speaker Heastie says he backs the idea, because he believes the current laws have led to a disproportionate share of African American and Latino New Yorkers being arrested for marijuana possession. And he says those criminal records should be expunged . Lerner, with Common Cause, says if legislators really can’t agree on anything, though, they should end the session . “If they’re not going to pass laws, well they just ought to be honest,” said Lerner, who said they should “just go home”. She says it would save taxpayers the $175 a day that lawmakers receive to cover expenses, whenever they are at the Capitol.